Potential customers are searching for contracting services online every day, but are they finding your website? For our many contractors, Localmize has helped generate new business with our website design and search engine optimization (SEO) services. We analyze your existing site and listen to your goals to build a custom website for your contracting business. Localmize also has in-house content curators that will develop unique text to help improve overall SEO to increase your organic position on Google. Localmize specializes in building and marketing contractor websites that drive web traffic and generate reliable leads for general contractor companies like yours. We combine our expertise in web development and online marketing to design more than just an attractive website; we create effective and easy-to-use revenue-generating machines. If you’re not working to improve your online presence or search engine rankings, it’s likely your competitors already are. Don’t settle for a cheap template that makes your contracting business look just like the competition. With Localmize, your website is customized to attract the types of customers and the service areas that you find most profitable. We utilize the best practices in order to produce unmatched results for our clients. Our team of web designers collaborate hands-on with each client to fully understand them and their company in order to grasp what they want to get out of a site. Custom website design is hard to find with so many templates out there however, our designers will adjust, add, remove anything on your site as many times as it takes, as long as our client is happy with the end result. A custom website increases sales by creating authority and authenticity online for your contractor business. A well-designed and optimized contractor website will help you get noticed by search engines and discovered by new customers. Localmize offers a complete turnkey solution for contractors. Localmize redesigned AG’s website, complete with image galleries and new pages to highlight this contractors’ many specialties. Localmize built a custom website for Done Right’s website, with before-and-after photos to showcase the contractors work throughout their area. Localmize redesigned Titan Concrete’s website in order to drive web traffic and attract new customs in their area. Their new website include additional pages to improve their search engine results for crucial keywords. 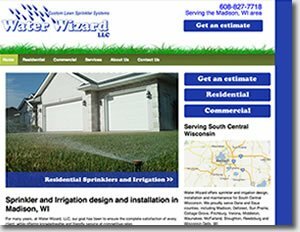 When you need a sprinkler system in Madision, WI, turn to Water Wizard. When you need a website for you sprinkler business, turn to Localmize. We constructed Water Wizard’s website to improve their online presence and emphasize their speciality services. Localmize designed Major Drain’s website from the ground up with an emphasis on usability to attract customers specifically within their most profitable service areas. Localmize conducted a major redesign of Duct Medic’s website, adding videos, images and pages that show off the many locations that this air duct cleaner works in. Localmize redesigned Baltazar Stone’s website, transforming it from an e-commerce type website into an elegant showcase for the beautiful stone work this Omaha contractor does for their clients. Localmize designed Garage Door Services’ custom website to establish a unique brand for the company and set them apart from the competition. Their new site has increased their web traffic and improved their overall search engine ranking. Interested in our online marketing services for contractors? Take a look at our contractor search engine optimization services! If you’re a contractor, and you’re serious about expanding your business call us today at 402-763-9491 or 877-700-1990 to speak with a Contractor Website Design expert.